The college is one of four schools in the world using The Alfred Lab technology to let students experience health problems they will be treating, increasing empathy and understanding. BIDDEFORD — Ryan Hoang sits at a computer, puts on a headset, and in an instant the 23-year-old medical student at the University of New England is transformed into Alfred James, a 74-year-old African-American man with advanced macular degeneration and high-frequency hearing loss. He is surrounded by family members celebrating his birthday, but he can’t see them without tilting his head to look around the large dark spot that blocks the center of his vision. They sing “Happy Birthday” to him, but it sounds like it’s happening under water. When he visits a physician about his advancing disabilities, his son speaks for him and the doctor shares complicated medical information in a business-like manner. 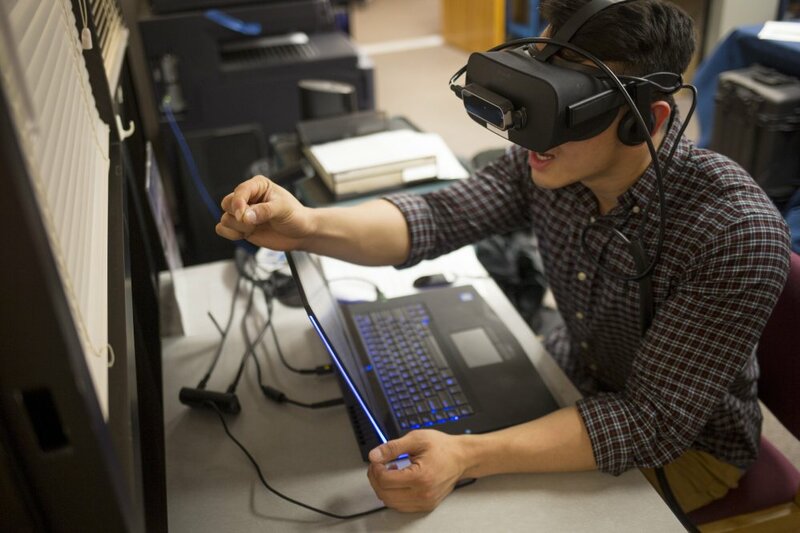 It’s a virtual reality experience that has none of the fun or excitement usually associated with video games, but it has become an important and eye-opening aspect of Hoang’s training to become a doctor. UNE’s College of Osteopathic Medicine is one of four schools in the world that are using The Alfred Lab to give students the rare opportunity for patient perspective training to increase their empathy and improve their practice. Developed by Chicago-based Embodied Labs, the new virtual reality technology also is being used at the University of California, Irvine, University of Illinois at Chicago and Fontys University of Applied Sciences in the Netherlands. UNE was able to buy equipment for four lab stations and subscribe to The Alfred Lab software through a $14,000 technology grant from the National Library of Medicine, said Barbara Swartzlander, the college’s library director. “It’s the only way young people can truly understand what it’s like to have something like macular degeneration and hearing loss,” said Marilyn Gugliucci, Ph.D., professor and director of geriatrics education and research at the college. The Alfred Lab is the latest addition to UNE’s geriatrics education program, which provides more than 30 hours of aging-related training and offers firsthand clinical experience as nursing home patients and hospice caregivers. The college is addressing a growing shortage of geriatricians, primary care doctors and other health care providers who serve the nation’s rapidly increasing senior population. It’s a problem that’s expected to become more acute in Maine because the state’s median age – 43.8 years – is the highest in the United States, in part because Maine also has a dwindling younger population, according to the U.S. Census. Yet UNE is one of few medical schools in the country that require significant geriatrics training. At other med schools, unless students choose to specialize in geriatrics, most get about five hours of training in aging-related medical issues, Gugliucci said. All 175 first-year med students at UNE were required to participate in The Alfred Lab this semester. The experience takes about 15 minutes, including brief tests before and after that gauge students’ reactions to being Alfred James. Virtual technology puts the students in Alfred’s seat at the dining room table and in the doctor’s office. The headset muffles Alfred’s hearing, so students struggle to understand his family and the medical staff. 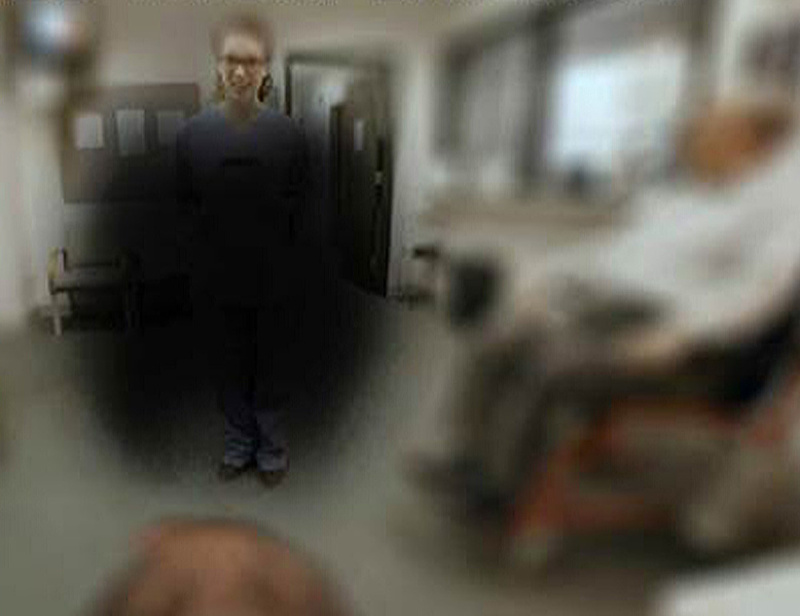 Students look down and around, trying to see beyond the black spot that mars their vision, a symptom of the retinal condition that is the leading cause of vision loss among people over age 50. Alfred shows no signs of dementia, but when the doctor asks him to take a written test that will assess his cognitive function, students reach out to grasp a pencil that appears before them and have difficulty completing the task. The response from students has been significant, Gugliucci said. Ninety-four percent said they had increased empathy for people like Alfred; 92 percent said they had a greater knowledge of macular degeneration; and 90 percent said they had a greater understanding of hearing loss. Sophia Panaccione is a second-year med student who accepted Gugliucci’s invitation to upper-level students who wanted to try The Alfred Lab. Panaccione has some clinical experience, working with patients one-on-one, so she came away with a clearer understanding of how the high-tech training relates to her future work. “It’s an eye-opening experience,” said Panaccione, 23, who plans to focus on internal medicine. Like many who experience the lab, Panaccione recognized how much Alfred had lost beyond his vision and hearing, including his independence, mobility, self-determination and ability to interact freely with people around him. With such a strong response from students, The Alfred Lab is set to become a permanent facet of UNE’s med school program and will expand as Embodied Labs develops new software for other medical conditions, such as dementia and end-of-life care. The company was started by four young technology entrepreneurs after CEO Carrie Shaw, 29, a medical illustrator and health educator, helped care for her mother when she was diagnosed with early-onset Alzheimer’s disease. The experience prompted Shaw to wonder if putting health care providers in their patients’ skin might make them more effective. “A lot of medical training focuses on treating a patient’s disease, but it’s so much more than that,” said Erin Washington, 33, who is Shaw’s sister and the company’s spokeswoman and curriculum architect. For now, Embodied Labs is focusing on geriatric issues because that’s an area of significant and growing need, Washington said. Future areas of innovation will help health care workers understand patients who are dealing with cancer, mental illness, obesity, literacy and language barriers, sexual and gender identity issues, and childhood disabilities and diseases. For Ryan Hoang, who is weighing a career as a psychiatrist, being Alfred James for a few minutes left a strong impression.